Preno can close a room automatically when another room is booked or closed. For example, if you have an apartment that is sold as one unit, but can also be sold as two separate rooms, you can configure Preno to close the room "Apartment" when either of the rooms is sold, or close the rooms when the apartment is booked. Connected rooms can be configured under Settings > Rooms > Connected rooms. Now, when Room 1 is not available (either booked or closed), Apartment will become unavailable too. If the rooms are connected to a channel manager, their inventory will be updated accordingly. NOTE: the connection is one way. 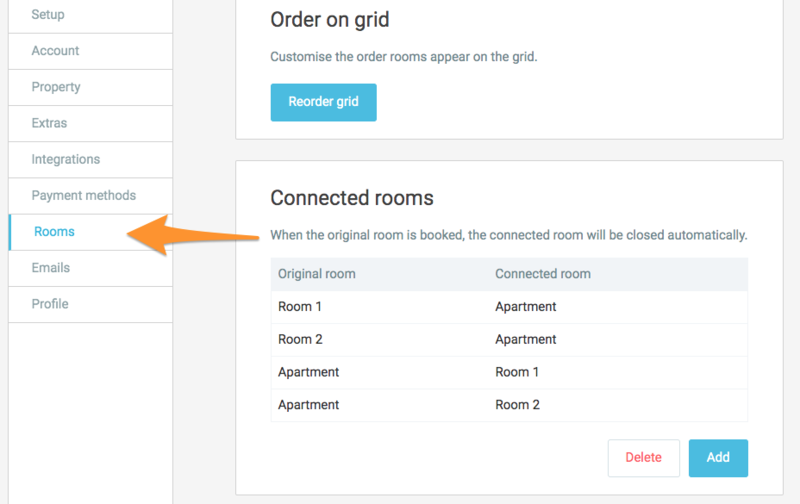 If you want Room 1 to be closed when Apartment is booked, you will have to configure it as a new connection. Adding a booking or a room closure to a room will close its connected rooms. The rooms will be taken out of inventory for the purpose of occupancy and revenue calculations. In the example below the occupancy is 50%: 1 room sold divided by 2 rooms available total.